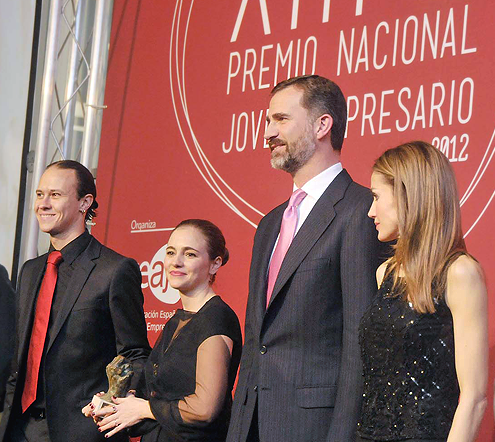 Last December, their Royal Highnesses the Prince and Princess of Asturias awarded Libelium as the most Innovative Company in Spain, at the annual meeting of the Spanish Confederation of Young Entrepreneurs (CEAJE). The Award Ceremony was held at "El Parador de Cádiz" and was attended by the Secretary of State for Energy, Fernando Martí, the Mayoress of Cádiz, Teófila Martinez, besides various representatives of Associations of Young Entrepreneurs of the country. Libelium was promoted as candidate by the Young Entrepreneurs Association of Aragón (AJE) as the most representative company of Aragón for the Innovation Awards, showing the good relationship and confidence between both entities.